In August, a cohort of NIU professors spent two weeks in Mandalay, Myanmar, working with Yadanabon University to lay the foundations for collaborative research projects. Because Myanmar’s higher education system has a long and tumultuous history, professors Wesley Swingley, Tomoyuki Shibata, Jim Wilson and Melissa Lenczewski are excited to have had this unique opportunity to work with an institution that, until relatively recently, was closed off from the outside world. Approximately 40 faculty members from Yadanabon University participated in workshops and on-site fieldwork training programs with the NIU professors. The education programs focused on the environmental sciences, with special emphasis on water, public health and geography. In recent years, Mandalay locals have noticed massive die-offs of fish in Lake Taung Tha Man, an important local resource and significant historical site. Local residents tend to attribute the loss of fish to “toxins” in the water. 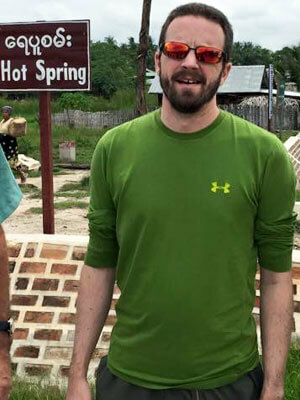 While in Mandalay, biological sciences professor Swingley focused on working with Yadanabon University faculty to create a more formal and scientific methodology for assessing the presence of “toxins” or contaminants in the lake water. The collaborative research team has a working hypothesis that the annual seasonal flooding of Lake Taung Tha Man contaminates the local well water, which is commonly used for drinking. 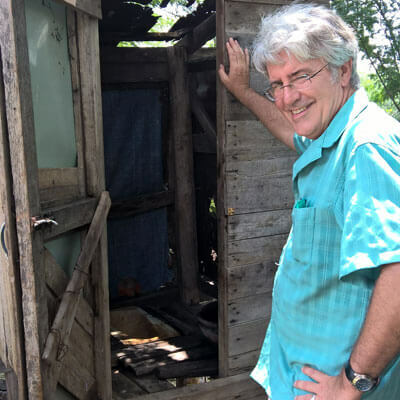 Swingley is interested in continuing to work with Yadanabon University faculty to engage in a comparative analysis of microbes in the lake water and microbes in well water to determine if this hypothesis is verifiable. Although there is no Department of Environmental Health at Yadanabon University, many professors in the departments of physics, chemistry and industrial chemistry showed interest in advancing knowledge and obtaining practical skills for environmental health related research. This perfectly suits Shibata, as he is both a professor in the public health program and a faculty associate for the Institute for the Study of the Environment, Sustainability, and Energy at NIU. 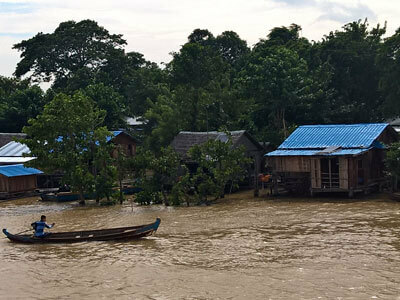 The convergence of environmental and human health is particularly important in Myanmar, where preventable diseases are often associated with water and air quality and are a significant killer of children ages 5 and younger. A part of Shibata’s work in Mandalay is to begin collaborative work with Myanmar colleagues to create organized systems to monitor environmental and public health. It is important that decisions regarding public health are based in scientific knowledge, and Shibata is working to ensure that Yadanabon University faculty have the tools they need to become familiar with the gathering and analysis of numerical, quantitative data that can be shared with the greater scientific community. While in Myanmar, the NIU cohort explored a number of field sites, including wells that provide drinking water, local hot springs, the Irawaddy River, Lake Taung Tha Man and municipal waste sites. Wilson helped to train Yadanabon University faculty in the basics of GPS technology using everyday smart phones and open-source technology. 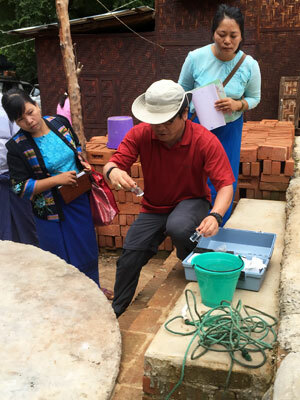 Together, he and Myanmar colleagues conducted a geographical pilot study at eight water test sites, including the well that provides drinking water at the university’s student hostel. “In addition to examining wells and and their environments, we plan on developing a geo-narrative of our field work experiences in Mandalay,” Wilson said. The staff, students and faculty at the Institute for the Study of Environment, Sustainability, and Energy hope that this recent trip to Myanmar marks the beginning of a long and productive partnership between Yadanabon University and NIU. Swingly, Shibata, Wilson and Lenczewski all extend their deepest gratitude to their host, rector of Yadanabon University Khin Maung Oo, who helped to coordinate the logistics of their trip and made everyone feel welcome in Myanmar. To learn more about the collaboration, the Center for Southeast Asian Studies will host a spring semester presentation on the NIU team’s research and experiences in Mandalay. The presentation begins at noon Friday, Jan. 29, in Room 100 of the Campus Life Building.